After learning how to use a database then we will try to do the basic commands on information systems CRUD (CREATE, READ, UPDATE, and DELETE) data using CodeIgniter. Besides CRUD in this example will also do the sorting and pagination. Case studies will be raised is the student data form. 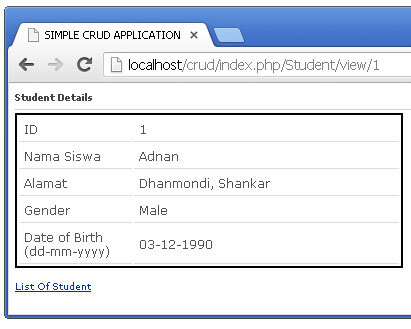 In this Article CRUD application to be created is an application that has a function to display all student data. Data shown have pagination (the distribution of the number of records displayed on a page website). Pagination is needed because we cannot possibly list all the data in a single layer. Besides a list of students was to feature sorting by field and have a list of student action menu. The above example shows how to use pagination library. The output of this library is composed of links of the page and a link to the next page (next)or previous (prev). Base_url should contain a function of the controller. The function will receive two parameters: the number of records and record per page what a show. In addition to the above parameters are still many other parameters that can be used to customize the pagination library. 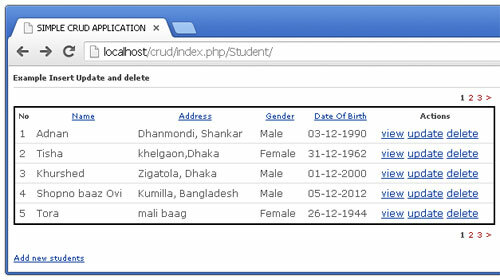 The table has five students in the field that the student id, student name, student address, gender, and date of birth. This table is used for storing student data. configuration doing here so that the application can connect to the database. The model is a model student in charge and responsible for the processes associated with the database. For example, store, modify, delete and retrieve data from the database. responsible for all operations on the table. Controller contains the logic to make the existing processes. As for the process to be handled by the controller is to display a list of students, increase student, change the student data, delete the student data and see detail students. // set form input name="id"
Note the lines in the function index ($offset = 0, $order_colmn = ‘ id ‘, $order_type = ‘ asc ‘). On the function There are three optional parameters that can be given through a URI. The parameter $ offset function to determine the first record to be displayed, $order_column function to determine what field you want to use to sort the data students and $ order_type function to determine the sort order (ascending or descending). To get the data according to the requirements (sorting and pagination) then called get_paged_list (line 37). After the student data obtained will be used to display table data libraries in the form of a table such as the look in (lines 61-105). To get the display Lists, you need to be made a view like this. View on the edit function is also used by students. 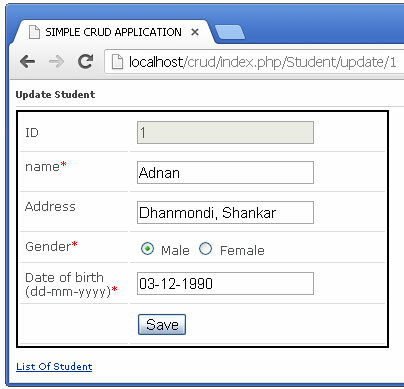 Storage it is necessary to perform a function called $this-> Student_model-> update ($id, $students); on the function needs to include the student id and student data that has been updated. Before performing delete confirmation needs to be done to prevent user errors in pressing the link action. Thanks for those extremely helpful tutorials bhaya. Your articles are little lengthy. If you could cut it in pieces that’d help new comers. I am pradip, from kolkata this tutorial section is really very very helpful and i want to connented asa developer as you. Masud can i get ur mail id .I want to learn more about open sources like ci, zend.Need ur opinoin. Best CRUD sample with CI. Get a 404 when trying to download the source code. Can you help with this please? Thanks in advance!